CoilyQueens™ : HELP my hair is a tangled mess!!! You just shampooed and deep conditioned your hair. 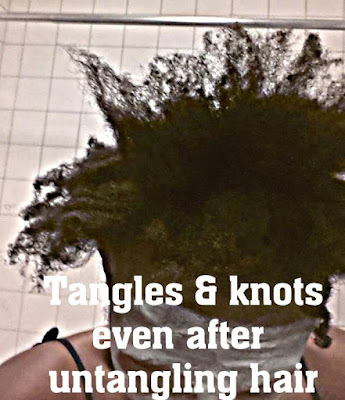 However after you rinsed out the deep conditioner you feel your hair knot and tangle up. Every time you run your fingers through your hair you feel massive tangles and mats. What did I do wrong? How do I fix this awful mess??? First consider this, people have combed out matured locks. If locked hair can be combed out then your tangles are easy to remove if you are completely natural. Now calm yourself by taking a few long deep breathes and do not fret. Worry will only make you anxious, and grab the scissors. Cover hair with a plastic cap and go make you a cup of green tea with lemon. Sip some green tea to relax your nerves. Drinking 3 cups of green tea daily will treat hormonal hair loss. Allow medium temp water to run over hair for one full minute, as you run your fingers through it removing tangles. Separate hair into 4 or more sections. Saturate each section with some CQR-Super Detangler. Gently remove tangles from each section retwist and cover hair with plastic cap for at least one hour or more if time permits. Remove plastic cap and gently with patience, remove tangles, using fingers only. Work in small sections and do not become frustrated. Frustration will make it take longer and cause breakage. You should notice the CQR-Super Detangler melting your tangles. Spray hair again if it dries out before you complete your whole head. Fingers only! No combs or brushes! When all tangles are removed, apply your leave in conditioner. You do not have to rinse out the CQR-Super Detangler. Be sure to subscribe to this blog for further assistance on your healthy hair journey. Solutions to all your hair issues. Helping you grow the hair you desire! If you try the CQR-Super Detangler come back and let me know how much you love it. Do you have a tangled mess horror story? Tell us about it below and what you did to overcome it. day 4: My hair feels like a baby's texture. I'm actually scared because all my conscious natural hair life I've known my hair to be rough, and dry ... and even in its most moisturized state, it felt rough. This new feeling got me all paranoid thinking I did a moisture overload.... i'm seconds away from grabbing that protein conditioner. Then again, I've never known my hair to be on a much MUCH manageable state. The key as you've stated, is patience. Whenever I come in contact with major knots, I spray some of the detangler on the section, braid it up, and come back to it a few hours later. By then the knots start to slip out, or its alot easier to isolate each strand from the knot. It's funny, my hair is ubber soft, yet so strong. It's freaking me out. Aside from the glycerin, I've used these ingredients before. I'm thinking This has something to do with how my hair is feeling. There are no substitutes for this super detangler. The jojoba oil is greatly needed. This is by far the very best homemade hair detangler I've ever seen! It left my hair moisturized for several days after use. How can I keep that same moisture level until wash day? Month 1: This concoction is so scary good that I'm encouraged to clear up my old products from my cabinet for my spring cleaning. I have an annoying habit of whipping up something and using it once or twice and throw it in the backburner for it to go bad after a while (even if its a good product). So I have been making this mixture in a 3 oz spray bottle which forces me to basically use it all up in one application. I added a squirt of my favorite leave in conditioner to make it even more moisturizing, which can lasts me a whole 5 days before my next hair wash.. .possibly longer if I gave it a chance. Im also experimenting with making this my styler, and it seems to be a detangler, moisturizer AND styler all in one in conjunction to my thicker oil mixture (I would highly advise Hydratherma's Hair Growth Oil....it is a bit on the pricey side, but when I ran out of it, I replicated it, and it still works very very well). So far so good. Hair still feels like baby hair, ends are starting to have less fairy knots. I have wavy hair definition when I put it in pony tails, and I'm not even trying!!! This is just great! JUST GREAT! Where can I find vegetable glycerin at? Amazing! Thank you for this! Just used it today and my hair loved it! Is it okay to use this with the hair steamer? Is the steamer necessary for better results? This is meant to be used in an emergency situation and it is assumed that you have already washed and DC. But now you have tangles. So this whole technique is used afterwards when there is a problem.....If you are asking about using the CQ super detangler with a steamer just by itself. I guess that is okay, if you have not already deep conditioned. Otherwise that would be to much conditioning and that can damage the hair. Hope I have answered you question. This is very helpful. After having used all of oils mentioned before and seeing amazing results, I've decided that this weekend will be my time to try this concoction. My hair is crying for help.